The annual report from the Spanish Land Registers’ Association (Registradores) reveals that foreign buyers snapped up more than 60,000 Spanish homes last year. 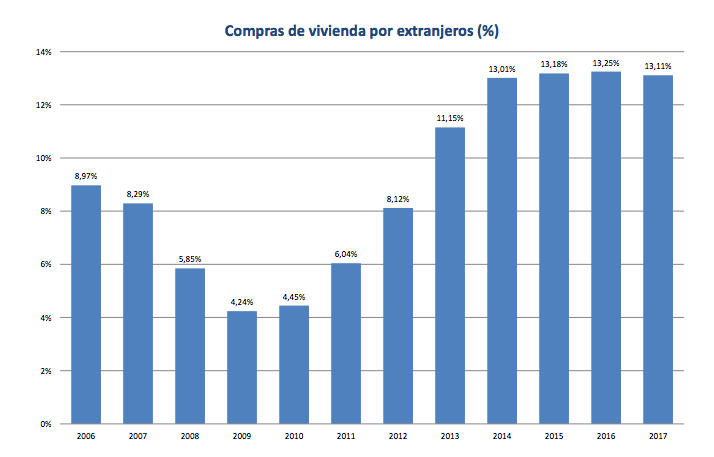 60,800 homes in Spain were acquired by foreigners last year, based on sales inscribed in the Spanish Land Register and analysed in the annual housing market report just published by the Registrars. This is a new record for foreign demand, above even the boom years, and the first time foreign buyers have acquired more than 60,000 Spanish homes in one year. The market share of foreign demand fell slightly from 13.25% of the housing market in 2016 to 13.11% in 2017 (see chart above), but only because local demand grew faster than foreign demand. 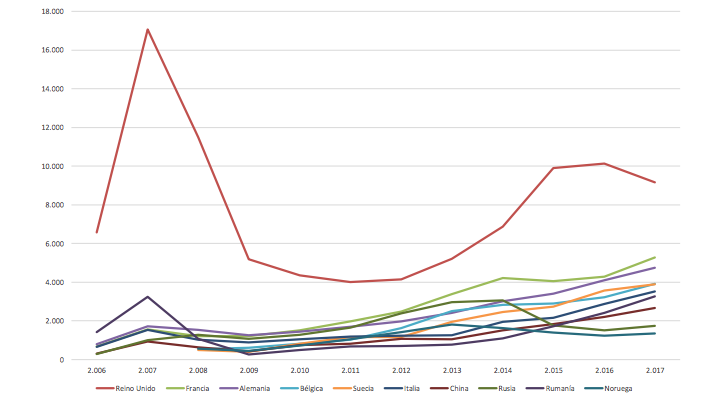 Foreign demand bottomed out as 4.24% of the Spanish housing market in 2009, and has been growing ever since. Overall foreign demand increased last year despite a decline in the dominant British market in the light of Brexit, as demand from all other markets rose (next chart). Nonetheless, the British are still 15% of the foreign market, and Brexit has had a relatively subdued impact on British demand, at least in volume terms. In value terms, the British market is likely to have declined by more, as many British buyers will have lower budgets due to the weaker pound and lower spending power in Spain. 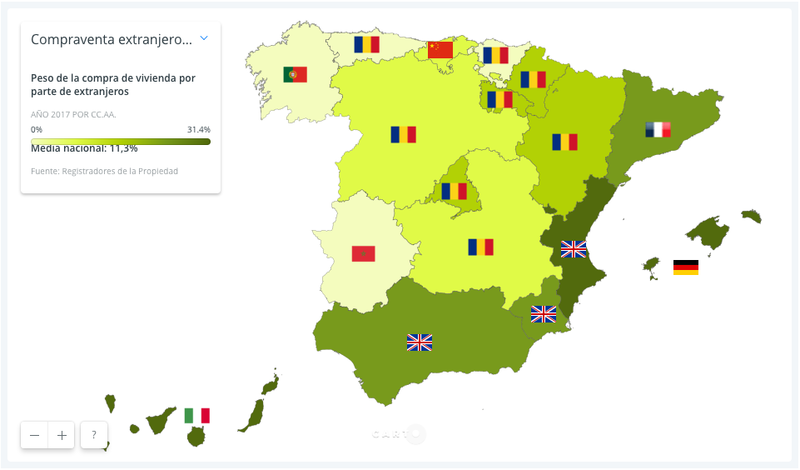 The following map shows the importance of foreign demand in each region, with a flag showing the nationality of the biggest group of buyers. The British were the biggest group of foreign buyers in Andalusia, Murcia, and the Valencian Region, whilst the Germans were number one in the Balearics, the Italians in the Canaries, and the French in Catalonia. The weight of different nationalities in each region has remained fairly stable over time, with the exception of Chinese demand, which has been growing fast in Catalonia. So the overall picture is one of the steadily growing foreign demand for Spanish property, whilst national preferences by region remain stable.